Some say that UCLA quarterback Josh Rosen is going to be the top pick in the draft since (per usual) the Browns have the top pick and (per usual) need a quarterback. But then again they may let him slip, or go with another QB meaning that Rosen, who this last season threw for 3756 yards, 26 touchdowns and 10 picks will be free, and who knows what team could try to move up and draft the 21-year-old from Manhattan Beach, California. Here’s a look at Rosen and what various places are saying about him. One of the top recruits of the 2015 class, Rosen decided to stay close to home to play his ball in Westwood. He was a first-team USA Today All-American as a high school senior, throwing for 3,186 yards and 29 touchdowns while his St. John Bosco squad won the California State Championship. UCLA coaches saw enough of his talent in the spring of 2015 (he graduated from high school one semester early) that they made him the first Bruin freshman opening-weekend starter ever. He won Pac-12 Freshman of the Year and several Freshman All-American honors after setting several school records and completing 60 percent (292-487) of his passes for 3,668 yards and 23 touchdowns (11 interceptions). Despite being only a freshman, he was in command of the offense and used his NFL size and arm to sling the ball all over the field. Rosen’s sophomore season had its peaks (400 passing yards against Arizona State) and valleys (three interceptions vs. Texas A&M), and eventually ended with a season-ending injury to his throwing shoulder after six starts (59.3 completion percentage, 1,915 yards, 10 touchdowns, five interceptions). The surgery to his shoulder was not considered major, so he was throwing effectively in spring 2017 practices. 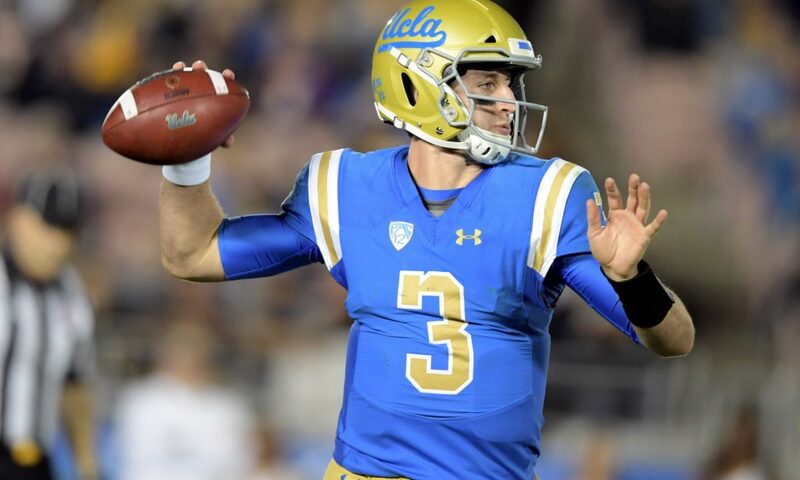 Rosen had the performance of the year in the season’s opening weekend, leading the Bruins in an amazing 45-44 comeback win with 491 passing yards and four touchdowns. He struggled over a four-game stretch at the start of the Pac-12 season, throwing eight of his 10 interceptions on the year. He did earn second-team All-Pac-12 notice, however, by completing 62.6 percent of his passes (283-452), throwing 26 touchdowns, and ranking second in the country with 341.5 passing yards a game (3,756 total). Rosen also suffered two concussions during the year, missing one regular season contest and their bowl game against Kansas State. Strengths Tennis prodigy with impeccable footwork and delivery balance. Plays with excellent coordination between eyes and feet. Gets head around quickly on play-fakes. Has experience under center. Anchors in pocket and doesn’t creep around needlessly. Trusts his protection and doesn’t take eyes of targets when pressure mounts from the edge. Climbs pocket when appropriate. Willing to stand and deliver in face of pressure. Completed 63 percent of his passes when blitzed in 2017. Accuracy totals negatively impacted by 31 receiver drops this year. Holds his water in pocket. Mechanics are terrific. Rarely over-strides and throws with consistently bent front knee. Throwing motion and follow-through are effortless. Extremely confident and intelligent. Throws receivers open. Might be best back shoulder thrower in the game. Shows ability to speed up operation time for move to next level. Very good usage of shoulder fakes and hitches to move defenders or buy additional time for receivers to uncover. Touch passer who can throw feathers when needed. Durability is a concern. Carries slight build and has had injury issues dating back to high school. Carries ball low in pocket with slight upward pre-throw hitch. Too casual in pocket set-up. Decision making and post-snap reads are inconsistent. Refuses easy throws at times. Arm talent and strength are below average. May need to make greater effort to drive field and seam throws. Poor career deep ball completion rate. Excess air under ball allows challenges. Lacks gun to challenge safeties with rip throws over the top. Needs better anticipation. Poor mobility. Struggles to elude early pressure. Completed just 42.4 percent of his throws when forced to move. Too much hero ball. Extends plays and takes unnecessary chances rather than throwing it away. Scouts question his passion for football and whether he will be a willing student. Who is this guy, and why should we care? Rosen caught everyone’s attention with a 3,670-yard freshman season in 2015. NFL scouts love the way he looks in the pocket — his footwork, throwing motion, anticipation and accuracy. After an injury-plagued 2016 season, he rebounded in 2017 with numbers nearly identical to those he put up as a freshman. Injuries set in again, though, and with Chip Kelly and a new coaching staff on the way in, Rosen will enter the draft. He’s enough of a prospect to merit consideration at No. 1 overall. Josh Rosen should be the No. 1 pick in the draft. From a talent, acumen and film perspective, he’s the best in this year’s deep quarterback class. If the Browns were smart, they’d take him and not look back. But there’s a reason the Browns are the Browns, and Rosen’s personality concerns are real. So as the rumors of Cleveland’s infatuation with Wyoming’s Josh Allen get louder, it seems increasingly likely Rosen won’t be their pick. No concerns with Rosen’s frame. He’s 6-4 and 218. He’ll likely pack on a few more pounds once he gets with an NFL strength and conditioning coach. But he has the height to see over the offensive line, and the weight to withstanding punishment from the defense. Unlike Sam Darnold, Rosen enjoyed his best statistical season this past year. Despite playing on an undermanned UCLA offense, he threw for 3,756 yards with 26 touchdowns and 10 interceptions. He completed a career-high 62.6 percent of his passes, and had a quarterback rating of 147.0. Rosen was the best Quarterback on the Bruins roster in the Spring of 2015 and was expected to fill in for 3-year starter Brett Hundley. Rosen would go on to have an impressive 2015 season going 245 pass attempts without an interception. As a freshman, he passed for 3,670 yards, 23 touchdowns, and completed 60 percent of his passes. He would go on to be named Pac-12 Freshman Offensive Player of the year, as well as earning Freshman All American honors. He would injure his shoulder the following year midway through the season as a sophomore and would go on to miss the remainder of the 2016 season. In 2017 he would go on to pass for 3717 yards and 26 touchdowns. The highlight of his 2017 season saw Rosen lead a 35 point comeback against Texas A&M. Rosen has the skill set to be a franchise Quarterback in the NFL. Rosen can be an accurate passer who can make throws in tight coverage and is poised in the pocket. Has a big arm. Throws a tight clean spiral. Has height to see over his offensive line. Has a good quick release on the ball. Can make strong and accurate throws on the run. Will take chances on some plays which can be a big trait in the NFL. Not very mobile but can keep plays alive by moving outside the pocket. Keeps his eyes down field even when under pressure. Struggles and hesitates when under pressure. Takes to many risks when under pressure. Is not a very consistent accurate passer. Can avoid pressure but not very quickly and relies too heavily on his offensive line to keep plays alive. Has questionable decision making that has led him to turning the ball over. Rosen needs to improve his vision for the NFL. He Suffered a shoulder injury his sophomore season that required him to miss the remainder of the 2016 season. One of his biggest weaknesses is his poor intangibles as a bad teammate and a leader.